The impairment of liver function is referred to be as cryptogenic chronic liver disease. Cirrhotic scarring in the liver, which is an irreversible process, is seen in cryptogenic chronic liver disease and hence it is denoted as cryptogenic cirrhosis. Mid–to late adulthood is often prone to cryptogenic cirrhosis. The disease is named to be cryptogenic, as the disease cause still remains unclear. But the common varieties of cirrhosis are mainly due hepatitis infection or chronic alcohol use. Fatty liver (non alcoholic) often causes liver function impairment and its chronicity leads to liver cirrhosis. Cryptogenic liver cirrhosis can be also by auto immune hepatitis and by gene mutation. During the first stages of disease, most of the patients are devoid of any symptoms but on later stages, it becomes more vivid. Yellowish discoloration of skin, whites of the eyes, mucus membranes, nail bud etc. Ayurveda gives the liver a superior status and considered to be at the seat of metabolism. The pitta dosha and rakta dhatu is mainly based in the liver. 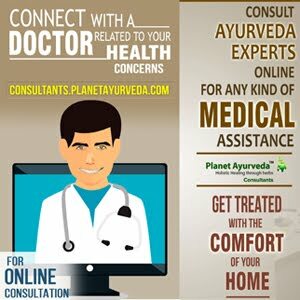 Considering the fact that the country is battling with one of the major health concerns, Planet Ayurveda puts forwards some excellent herbal remedies to tackle with cryptogenic chronic liver disease. Andrographis paniculata – 'the king of bitters' – is indigenous to India and is used widely to treat infections. It is well known for its immune boosting powers. The anti-inflammatory property of kalamegh is used in the treatment of cryptogenic chronic liver disease. The leaves, fruits and flowers are all packed with the powers to fight against diseases. Its powers are best used in liver cirrhosis & also in respiratory tract infections. Dosage – 2 capsules twice or thrice a day after meals with lukewarm water. Yakrit plihantak choorna is best in alcoholic liver diseases, fatty liver and enlarged spleen. Dosage – ½ to 1 tsp full twice a day, with lukewarm water or fruit juice after meals. 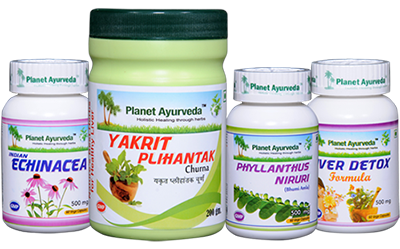 The potent liver cleanser, phyllanthus niruri capsules are manufactured out from the standardized herbal extracts of the herb, bhumi amalaki (phyllanthus niruri). The antioxidant property and the antimicrobial activity of the drug enhance the liver function. The proven statistical study on phyllanthus niruri shows decrease in insulin resistance and reduction of fatty liver symptoms. It is considered to be the best drug for an enlarged liver. Dosage – 2 capsules twice a day after food with lukewarm water. Hepatitis, cirrhosis, jaundice and all other liver disorders are well managed using liver detox formula. It is guaranteed by Planet Ayurveda that the use of liver detox formula will certainly help you to improve your liver functions. SGPT & SGOT are well balanced using liver detox formula. Dosage – 1 to 2 capsules twice a day with lukewarm water either half hour before food or half hour after the food. From the recent studies and research, it is proven that phyllanthus niruri is an eminent hepato protector and also embedded with antimicrobial activity, which is an efficient cleaner of hepatitis virus. Also andrographis paniculata is packed with the efficiency to minimize the raised levels of SGOT & SGPT in liver function tests. The Liver Care Pack can be taken by any liver patient to improve its function, after consulting with your doctor. You can also have this to improve the overall health & immunity, if you are chronic alcohol user.